Gina K of StampTV has set this challenge, So, what is your favorite summer memory? I remember when I was 6 or 7 we went to Jersey, it was one of the hottest summers ever (do they always seem hotter looking back?) We escaped to the air conditioned cinema for a few hours, my dad and brother saw Journey to the center of the Earth or something like that, but mum took me to see Bambi. I did cry but I loved that movie, in fact I love all the Walt Disney movies. 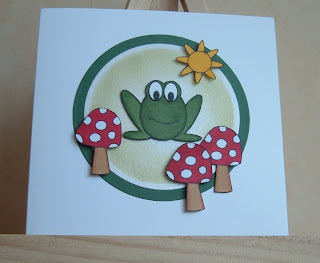 Every time I look at Tami Mayberry's set of Fairy Tales stamps the mushroom always makes me think of Disney, so here is my card. I know there was no frog in Bambi but I had to add him in because I love him hehehe. Cuuuuttte card! Love that frog. What a lovely story and very Disney card. So appropriate for the challenge. Thanks for bringing a smile to my face today. Too cute! The little mushrooms are so happy! This is adorable and great story of your summer memory!! Hee, hee..... I am sure there was a frog hiding somewhere in the forrest! LOL.... love this card!